How does a long established brand branch out to new audiences? Wincrest have been building homes for Sydney families for over 60 years. Their founders were among the pioneering builders of the 1950s, building the iconic ‘red bricked’ house throughout the suburbs of NSW. Taking the most memorable elements of the current identity system, and casting aside everything else, our team developed a new identity system for a new brand called ‘Wincrest Bespoke’. Driven by minimalism, striking photography and a simpler visual structure Wincrest Bespoke aligns to the strongest parts of the parent brand, whilst introducing new elements that communicate customisation, personalisation and luxury. A committed brand should ensure all of its brand experiences are cohesive and intentional. With that in mind, we ensured all physical brand objects, including information collateral, brochures and marketing items were all created using only the finest materials. This creates a direct tangible connection between branded object and desired perceptions of bespoke home design. 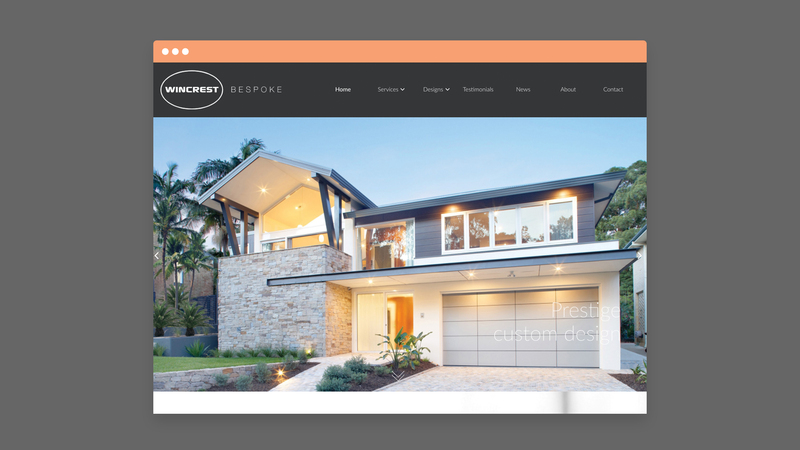 The Wincrest Bespoke website carries these intentional brand directives and provides a minimal, photography driven, digital experience. Functionally effortless, it ensures the brand is delivering the same message both on and offline. Tamlyn Creative’s significant creative and strategic design experience is helping us to take our business to the next level.